Hublot has ventured into the competitive courts of Kobe Bryant and captured his fierce competitive persona in the Power King Black Mamba watch, to the extent that it brings a come hither appeal that’s so venomous it’s sure to visually stun the fellas. Kobe Bryant Hublot Power King Black Mamba (Reference 748.CI.1119.PR.KOB13) authoritatively entered the Hublot King Power Collection and has quickly gained profound respect that the black mamba is even present on the dial. Power King Black Mamba venomously charms with a 48mm micro-blasted black ceramic case and a micro-blasted ceramic and titanium bezel secured with six black PVD H-shaped relief titanium screws. The open-works dial reveals a silver/black colored Mamba that flamboyantly slithers around the counter at 9 o’clock and Kobe’s court number “24” at 6 o’clock. The dial has been designed based on an elaborate layering concept to reveal the fusion of its aesthetic DNA. Power King Black Mamba’s outer dial features purple numerals in five minute increments, four zones of 12 minutes in black and gold satin-finishes and hour indexes with 3N gold plated and black Superluminova™. The hour/minute hands also have 3N gold plating with black Superluminova™. Power King Black Mamba is Swiss Made and has Hublot’s HUB 4248 mechanical self-winding chronograph movement which consists of 249 components. It has 28 jewels, a frequency of 4Hz with a power reserve of 42 hours, and it is water resistant up to 10 ATMs. Black Mamba is adorned with, of all things, a python snake strap that is sewn on black rubber, and it has a clasp deployant buckle that is micro-blasted black PVD titanium and ceramic. Kobe Bryant Power King Black Mamba is a limited edition series timepiece of 250 numbered pieces, and is said to be inspired by Kobe’s personality and long standing basketball career. 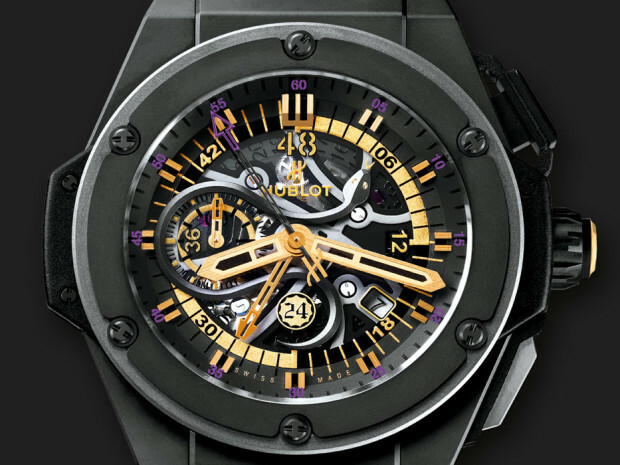 Hublot formally announced Kobe Bryant as one of their newest brand ambassador on March 20, 2013. 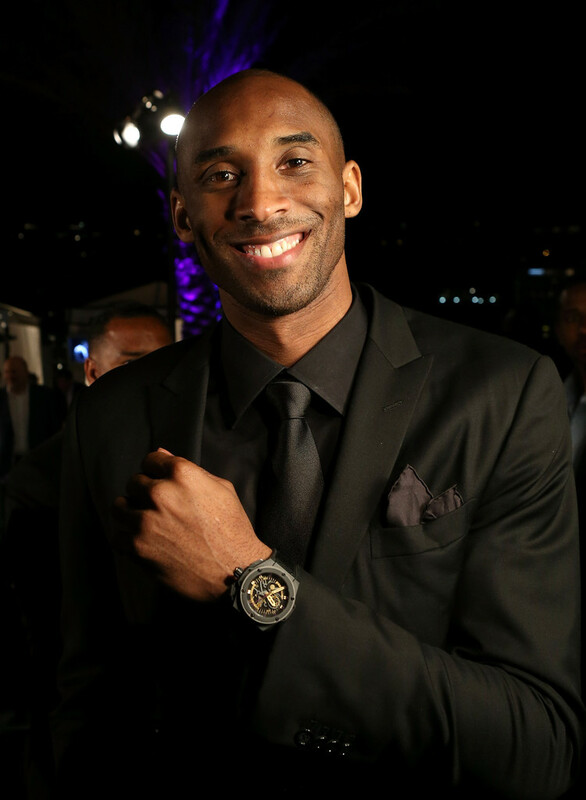 Bryant a 5-time NBA Champion and team member of the Los Angeles Lakers was pleased to join the ranks of Hublot’s other notable ambassadors Olympian Usain Bolt, basketball star Dwyane Wade, and soccer legend Diego Maradona. 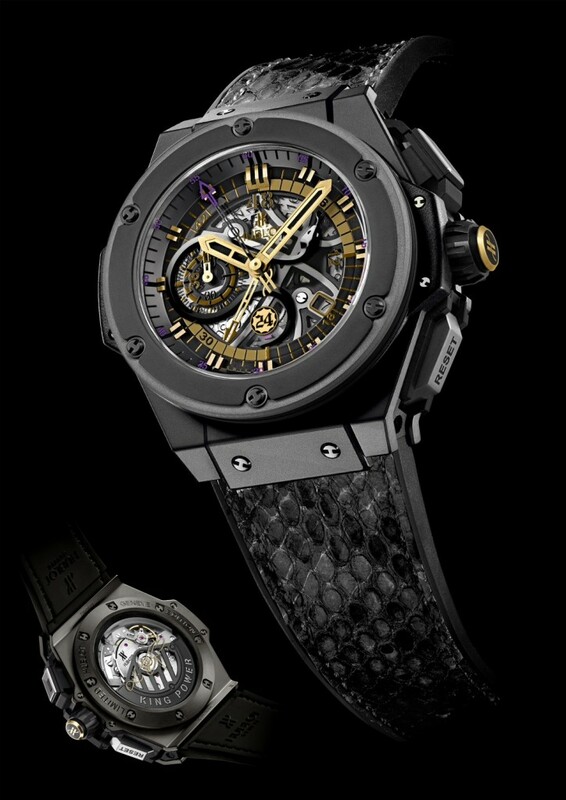 Hublot also announced that sales of Hublot King Power Black Mamba will also help support the Kobe and Vanessa Bryant Family Foundation whose focus is to help families in need regain self-sustainability through financial solutions. 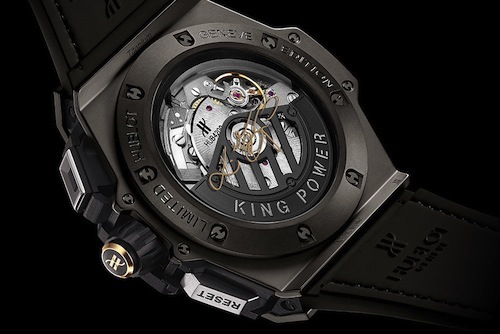 Hublot Power King Black Mamba will not be around long so Kobe Bryant fans should move quickly to purchase Power King Black Mamba as mentioned earlier there are only 250 watches available.